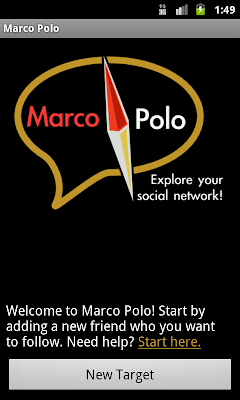 Marco Polo is an app to follow your friends' location via their social networking feeds. It can aggregate geotagged posts from Facebook, Twitter, Foursquare, and Flickr, and then show those posts on a map. 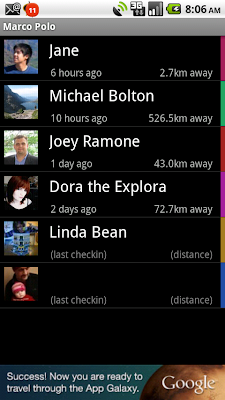 You can also 'find' your friends from your current location by using the compass! 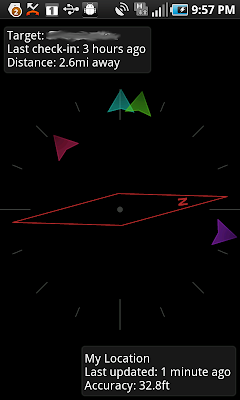 Version 0.1 was released on 2011/07/01. Download it now from the Android market! Need help getting started? Check out the help and FAQ page. The app is still in beta, and eventually will incorporate a points system and a way to play "Marco Polo" by sending location-tagged messages back and forth through the app. Please send feedback! You can only follow people who you are already friends with in your social networks. This is to keep you from stalking people who would rather be left alone :) Location-based posts are stored for a maximum of 7 days (configurable in app settings) or 3 hours for Foursquare posts, per their TOS. 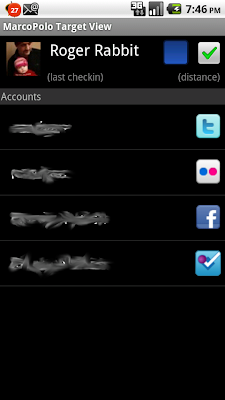 Your posts or your friends' posts are never sent to any third-party servers, they are only stored on your device. Your location data will be used to serve (hopefully relevant) advertisements. Cache debugging: Page was rendered Apr 21, 05:14:46.